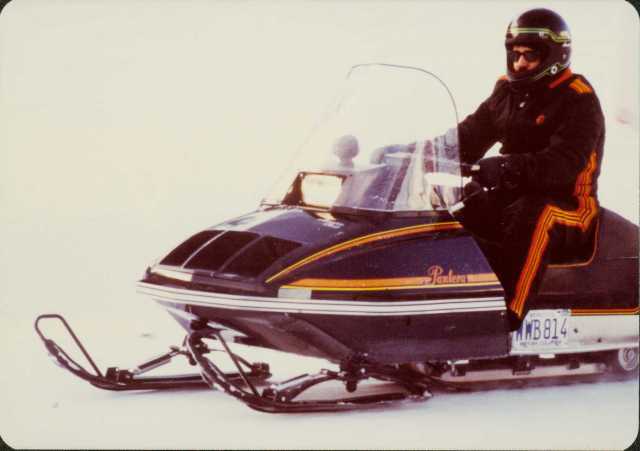 Photograph depicts DeCecco wearing helmet and snowsuit while seated on Arctic Cat "Pantera". Item is one of 72 photos comprising album generally depicting community oriented photos. Album has been rehoused, original order maintained. Photo information determined by individuals who contributed to Northern BC Archives Facebook Photo ID Project, contact archivist for more information and commentary in research file pertaining to this photograph. Item is part of the Cassiar Asbestos Corporation Ltd. fonds. Image is one of 72, see also items 2000.1.1.3.19.108 - 2000.1.1.3.19.179. Photographs originally stored in album with "CASSIAR ASBESTOS CORPORATION" sticker and logo adhered to cover. Original accession no. : 2000.1.0228.016 [this photograph came from box 228].